Start by bringing a medicine ball overhead, coming up onto your toes and into spinal extension, and smash the ball down as hard as you can. The next progression here is to bring the squat into a dynamic side to side movement. Smash down and squat side to side. Our last progression adds a really dynamic skip. Start with getting the skip going and then we add the smash. So we skip and we skip and then we add the smash down. You'll get some great work with your tennis serve with that one as well. Keli Roberts is a specialized tier-three personal trainer at Equinox in Pasadena, California. She is a master trainer for Schwinn® Cycling and Glidingn, a Kettlebell® Concepts-sponsored athlete and is on the BOSU® development team. Keli is also known for her award-winning videos, books and training seminars. 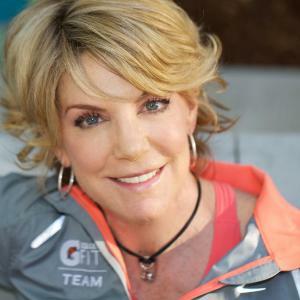 She is a spokesperson for ACE, a 2007 inductee to the National Fitness Hall of Fame and was awarded the 2003 IDEA Fitness Instructor of the Year Award. ... read more.